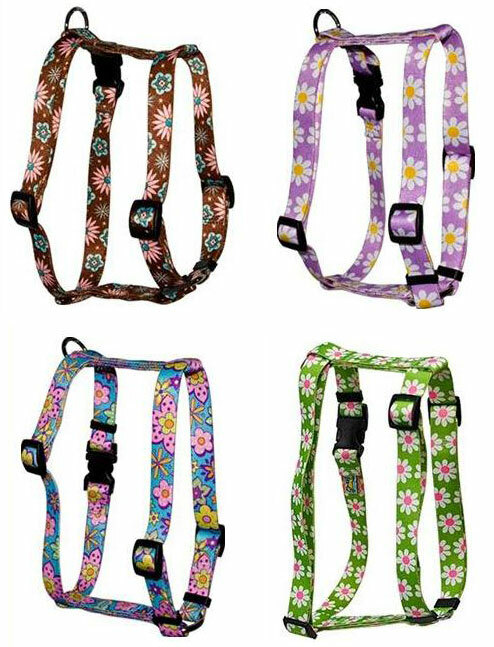 The dog harness features vibrant colors and fun designs. The dog harness and matching leash are made of 100% dye-sublimated durable polyester, colorfast and machine washable. The designs are printed with a special heat transfer process onto a heavy braid. Made in the USA. buy a matching dog leash together with a harness, and save! yellow dog dog harness and leash, retro, vintage style, 60s, 70s, sixties, seventies, peace, flowers, daisies, floral, sunny, bright colors, multicolor, multi colored, fun, happy dogs, vivid colors, playful, summer, spring, joy, happiness, popping, pop, rocking, rock, hues, shades, cool, trendy, hip, urban, awesome, colorful, beautiful, affordable, pattern, style, stylish, male (masculine, for a boy dog), female (feminine, for a girl dog), matching leash, comfy, pretty, designer fabric, cloth, design, made in the USA, dog harness and leash set, dog harness and lead set, yellow dog design, dog collars and leashes, matching harness and leash set, matching leads, matching dog couplers, matching dog collars, latest fashion, fashionable, decorative, strong, durable, tough, for small dogs, medium dogs, and for big dogs! Yellow Dog Dog Collars and Leads / Leashes: Flower Power Collection. 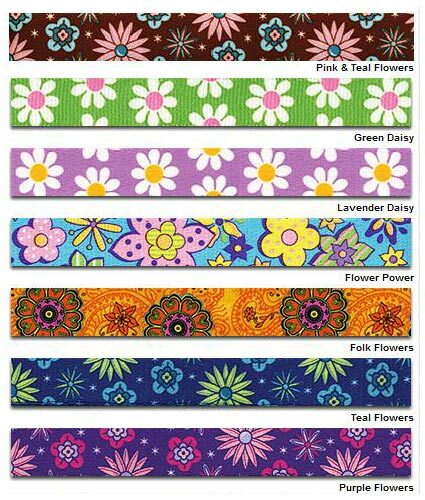 Retro style dog collars, colorful patterns with flowers. Leash sold seperately. Category nylon, fabric, cloth, and ribbon collars and leads w. colorful patterns. Dog Harness and Leash set. YellowDog Design. These dog harness and leash sets feature vibrant colors and fun designs. The harnesses, leads and collars are made of 100% dye-sublimated durable polyester, colorfast and machine washable. The designs are printed with a special heat transfer process onto a heavy braid. Made in the US. 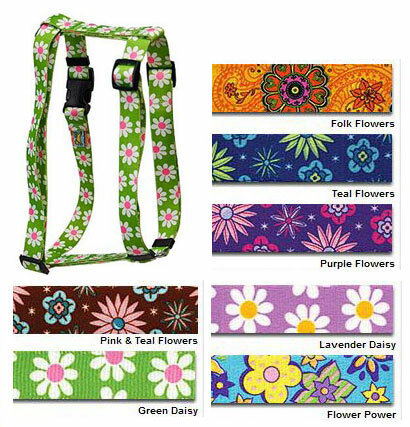 buy a matching Easy Grip dog leash together with a collar, and save!, dog couplers in these designs are available, too!, standard dog leashes in these designs are available, too!, standard (buckle) dog collars in these retro flower designs are available, too!, dog harness in these retro flower patterns available as well! Keywords defining the Trend Setter Flower Power Martingale Dog Collars: yellow dog dog harness and leash, retro, vintage style, 60s, 70s, sixties, seventies, peace, flowers, daisies, floral, sunny, bright colors, multicolor, multi colored, fun, happy dogs, vivid colors, playful, summer, spring, joy, happiness, popping, pop, rocking, rock, hues, shades, cool, trendy, hip, urban, awesome, colorful, beautiful, affordable, pattern, style, stylish, male (masculine, for a boy dog), female (feminine, for a girl dog), matching leash, comfy, pretty, designer fabric, cloth, design, made in the USA, dog harness and leash set, dog harness and lead set, yellow dog design, dog collars and leashes, matching harness and leash set, matching leads, matching dog couplers, matching dog collars, latest fashion, fashionable, decorative, strong, durable, tough, for small dogs, medium dogs, and for big dogs! The Trend Setter's 60's & 70's retro is a fun line, featuring some of Yellow Dog's most popular designs. Daisies and other flowers, bright colors. Martingale dog collars, adjustable collars, leashes, dog harnesses and dog couplers. Section nylon, fabric, cloth dog accessories.